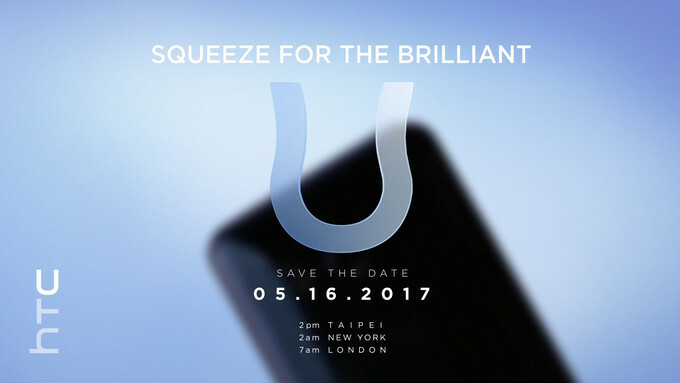 HTC U Unveiling on May 16 - Playfuldroid! The media invitations sent out by HTC states that it will be holding an unveil event on May 16. Even though the teaser directly tells about HTC U flagship phone, there are several hints which suggests that it will be unveiled in the coming month. According to the media invitation, the launch event will be held at Taipei at 2 PM, at New York at 2 AM and London at 7 AM. Rumors have it that the alleged HTC U flagship has touch-sensitive frame calethat will let users access various functions of the phone through gestures and grips on the edges. An official tweet shows a hand pressing the edges of a mysterious smartphone. Even the alphabet U in the tweet is squished which suggests that the HTC U will be unveiled at the upcoming launch event. HTC U is speculated to come with a 5.5-inch quad HD display and it will be powered by Snapdragon 835 SoC. Other rumors specs include 6 GB RAM + 128 GB storage, 4 GB RAM + 64 GB storage, Android 7.1. Nougat OS, 3,000 mAh battery. A leaked video that surfaced earlier this year has already the revealed the smartphone and its innovative Edge Sensors. Is it Andy Rubin’s Essential Phone in the Michelin Ad?